Despite walking nearly 25 miles, I still hadn’t reached Leighton Buzzard, site of childhood holidays and source of my first Robert E. Howard Conan book (as described earlier). I had gone to sleep in the MK hotel to the sounds of drunken revelry turning nasty, closing-time shouting and what sounded like barking police dogs from seven floors below. No evidence remained in the empty square this sunny morning. For the second week running, I enjoyed a solitary breakfast, and headed to the station – walking like the Tin Woodman in the aftermath of yesterday’s exertions. I walked up to WHSmiths, not really knowing what to expect or what, specifically, I was looking for. It was market day, and a stall outside sold graphic novels – a good omen, as if this was some special site for the fantastic, a ley line intersection of pulp imaginings. Inside, on my patch of personal holy ground, I walked through the modern-day Smiths – dirty, down at heel and directionless (the shop that is). I looked at the fiction shelves, knowing of course that Robert E. Howard books were unlikely to be there for today’s 13-year-olds to find. But… I was wrong. Not only was there an REH book, but one I didn’t already have – The Haunter of the Ring, a collection of supernatural yarns. Buoyed by this find, I strolled slowly around the sunny market square. The book, the fine day, the trader offering a cabbage and a cauli for one pound fifty, the two old Polish guys smoking on the steps of the Market Cross – all seemed like a reminder that, as Howard wrote (giving his barbarian hero a bipolar upswing), ‘Life was good and real and vibrant after all, not the dream of an idiot god’. Soon it would be time to get the train back to MK, then home. For now I was glad that the place I remembered seemed in good spirits. Easier to let go of the past knowing that some of its places are carrying on by themselves in a good style. Wanting an early start, I walked down the empty Midsummer Boulevard to get the first X5 bus to Buckingham at 5.50. The heatwave seemed to have broken, the air an aspic gray. The bus was quite full of long-haul travellers headed for Oxford and early-shift workers. As we sped along the A421 I realised that I had left my map in the hotel. It would have been perfectly possible to buy a return ticket and go back, but to do so would have seemed somehow… ignoble. I resolved to find one in Buckingham. The bus set me down outside Tesco, where I had finished the last leg. The supermarket was open 24 hours, and I bought supplies for the day. No maps on offer however. Ditto the Total garage. Tesco’s own garage had maps – it even had the orange Explorer maps that I use – just not the one I needed. So I headed into town to wait for WHSmiths to open, a 90-minute wait, watching the town come to life in a gray drizzle – beginning to feel a Conanic ‘gigantic melancholy’. However, by 8.35 and I had the right map in my hand. Back-up plans involving the library (open at 9.30, would definitely have maps but may have applied strict copyright laws and forbidden photocopying) and the University bookshop (open a 10 and would have been the last resort) were not required. A Subway was open too, so I treated myself to a coffee and set off through parks by the Great Ouse. The fields were lush and wet with rain, so that walking through them gave my legs a cold shower and turned me into a seed-bearer. A bit of the dismantled railway line and some road walking took me towards the Padbury Brook. Part of the path crossed a field waist-deep in plants – don’t know what they are, but the flower-heads looked as if they will flower soon – future walkers will be wading through a pink sea, buzzing with bees. I got lost on the brook and had to navigate my way back on to the route. Moral: it’s never the compass or map that’s wrong, it’s always you. Fed up now of walking along soaking, vague pathways and roads with cars regularly swishing past, I was contemplating finding a rural bus and giving up. A disused railway came as my salvation. The stretch of the Oxford-Bletchley line still has tracks, albeit broken and grown through with foxgloves and saplings, and isn’t an official cycleway or any kind of leisure amenity. Walking along it seems neither forbidden nor compulsory. I followed it for around 2.5 miles to Winslow, enjoying its overgrown hidden world, like a ruined future or a branch line for ghost trains. It was brightening up now, so much so that I was able to shed layers of clothing. I walked through Winslow and on to Swanbourne, where I stopped for a drink in The Betsey Wynne. This new pub, built by the Swanbourne Estate and named after a famous diarist of the Napoleonic era, was very pleasant – somehow combining a Milton-Keynes-style spacious anonymity with a rural feel. I wished I had got there early enough to sample their locally-produced food, having lived on oat bars for 10 miles. And we were back to ‘summer classic’, with blue skies and white clouds as I walked on to Stewkley and Soulbury, approaching places dimly recalled from childhood holidays. The countryside resembled that I walked through last week, perhaps because I had resumed the walk too quickly, so that ‘they’ had not had time to assemble any new. “Do not make too much haste on one’s road” says Chilon of Sparta, wisely in my view. The going was easier now, through green lanes and open fields. The hedges were lush and overgrown, so one never quite knew what a new stile would reveal. Not much more to say – I was aching from the long walk (GPS clocked over 24 miles, mostly done with sodden feet) and marched through the last few miles of summer fields largely oblivious. On the final bit of road towards Linslade, I found this drinking fountain, on a stretch of road now fit only for cars, built for Victoria’s Jubilee and restored for Elizabeth’s in 1977. Instead of water it offered me this ‘vomiting lion’ motif. Limped into Linslade. It was too late to go to Conan’s realm of Leighton Buzzard, so I found the station; chatted about I-Spy with the ticket guy (I now wear the badge); got back to MK and walked up the Boulevard. Decided to eat at Wetherspoons as I didn’t think I’d have the energy to come out again once I reached the hotel. I love this building: newly built, like a giant car showroom, but with corners of wood-panelling like a screensaver of pubbishness. The Atlantis flyer had been replaced with one for an Independence Day beer due to go on sale the next day, July 4th. I put on headphones and listened to Astral Weeks, a favourite summer album, blocking out the soundtrack of the bar. My other senses heightened, I noticed how two separate lone men were muttering to themselves, checked I wasn’t doing the same (maybe mouthing Van’s lines about ‘the viaducts of your dreams’), smelled delicious roll-up smoke drifting in from the bright terrace, tasted the clear brown depths of beer while the young couple next to me drank champagne. As the Buddhists at the nearby Peace Pagoda may do on occasion, I radiated waves of love and compassion outwards in ever-increasing circles, across the MK street grid, the Buckinghamshire fields and the sunken lands where made-up adventures happen. The last two days of walking have been triangulated against some kind of literature. 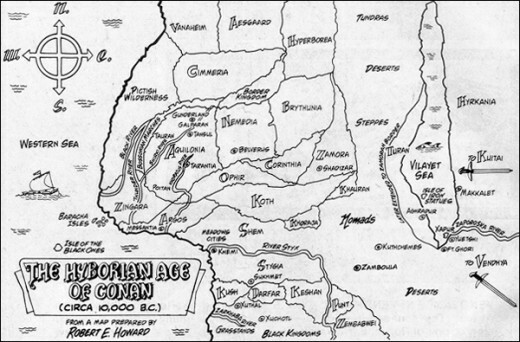 The next will be no exception, as I am heading for Leighton Buzzard where, back in about 1974, I bought a book that has retained great meaning for me over the years – Conan of Cimmeria. 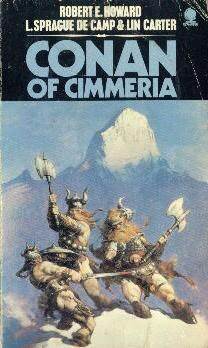 This paperback, which I have in my bag, was the first collection of Conan stories I read. Robert E. Howard’s sword-and-sorcery hero captivated my teenage imagination – stories about a marvellous world combining every kind of adventure story, full of scary monsters a bit like those of H.P. Lovecraft, but with a hero who prevailed over them rather than passively subsiding into insanity as HPL’s protagonists tended to do. For me, the Hyborian Age started in the WHSmith in Leighton Buzzard, LU7 7DN – accessing a rich seam of pulp literature, and a sense that one should (as the Quakers say) ‘live adventurously’. So revisiting the place is an essential milestone on this walk. “Hither came Conan, the Cimmerian, black-haired, sullen-eyed, sword in hand, a thief, a reaver, a slayer, with gigantic melancholies and gigantic mirth, to tread the jeweled thrones of the Earth under his sandalled feet” wrote Howard, describing what we might now call a ‘portfolio career’ – rather than specialising in, say, ‘reaving’ as a job-for-life, Conan use his transferable skills through many roles – buccaneer, mercenary, king etc. Similarly, I have multiple roles (albeit less colourful – ‘Hither came Mister Roy, a marketeer, a science fiction fan…’ doesn’t set the pulse racing). Whereas Conan tends to progress from one thing to another, my various aspects all seem to coexist, which can make me feel like the leader of a small unruly squadron, always threatening to deploy the wrong technique at the right time: doing a business presentation as a piece of performance art, turning a poem into a marketing matrix. Life is complex like that and I guess we’re all mashups of diverse elements. As well as multiple identities, there are multiple realities to negotiate. In a great piece about London, Michael Moorcock suggest that creation of virtual identities and virtual living environments is a survival strategy, effective ‘as long as we’re fully conscious’, and talks about psychogeography as the recovery of lost London. Personally, I’m not from London, so I don’t have those particular ancient paths to rediscover. My quest is to stitch together the places and times where I’ve ended up, virtual or otherwise; an assemblage of cities, towns and villages and the unknown tracts of lands in between. Which is why I’m walking, trying to explore my own real/virtual worlds by physically slogging through them. Rather than psychogeography I’m calling what I’m doing autobiogeography – a conflation of ‘autobiography’ and ‘geography’, but also the ‘biogeography of myself’ – my own physical (blood sweat blisters and local real ale) interaction with places. As well as walking I’m creating this meandering document, like Conan in his throne-room, drawing a map of the semi-legendary places he had wandered through, because the official ones were ‘vague and faulty’ concerning his ‘northern countries’. All of which brings me to be walking up Midsummer Boulevard in Milton Keynes, on a hot midsummer night. I haven’t discovered any evidence of Conan’s prehistoric Hyborian Age, but in a Wetherspoons I find unexpected evidence of an even more ancient world – a flyer for an art show called All Hail Atlantis, vortex of illumination. Milton Keynes isn’t actually on the walk, but will be my base for two nights while I try a haul from Buckingham to Leighton Buzzard. This is the longest time I’ve spent in MK and the experience of visiting the centre is very enjoyable – I love the spacious walkways and unbroken modern-ness. Perhaps I’m appreciating what J.G. Ballard described as ‘the ambiguous but heady charms of alienation and anonymity’. The Encore hotel, a new sub-brand of simple-cheap-efficient sleeping machines launched by the Ramada chain, seems intent on counterbalancing any alienation with words: they are ‘exciting, passionate, fresh, stylish, vibrant, upbeat and refreshing’. By Crom, that’s a lot of adjectives – qualities I hope will infuse me during a long walk. To Brighton Pier 5/5: home to 50.